As I recall, back in 1997 nobody had cell phones in Russia. * Now they are all over the place. “Mobile phone” is trans­lated мобильный телефон or мобиль­ник, and cell phone is trans­lated сотовый телефон, although sometimes people just say сотовый. And young Russians send text messages like crazy. Properly speaking, the text message protocol is called SMS, the Short Message System. “Text message” is translated текстовое сообщение, but really almost no one says that. Usually people write СМС (pronounced эсэмэс) or смс-ка (pronounced эсэмэска), or sometimes they just write it in Latin letters as SMS. Жду тебя у входа в библиотеку I'm waiting for you at the entrance to the library. - splu. S Pashoi. Hristos Voskres! Although many Russian cell phones can now send/receive text messages in Cyrillic, often people send them still in Latin letters. Sometimes they do this because the person they are sending to has a phone that can't receive Cyrillic. But there is another reason that people write in Latin even when both sender and receiver have phones that work with Cyrillic. It turns out that for technical reasons a Cyrillic text message is limited to a maximum of 70 characters, whereas one written in Latin letters and numbers can have up to 160 characters. Я только что получил смс-ку от подруги. I just got a text message from my girlfriend. Советую набирать все смс-ки латиницей, потому что латиницей в одну смс-ку помещается в несколько раз больше символов, чем кириллицей. (Adapted from this source) I advise writing all text messages in Latin letters because using Latin one text message can hold several times more characters than using Cyrillic. Прочитай эту смс-ку. Я не совсем понимаю, что она значит. Read this text message. I don't exactly understand what it means. Я посылаю, наверное, двадцать смс-ок в день и получаю примерно столько же. I send probably twenty text messages a day, and I receive roughly the same number. Пришли мне смс-ку, когда закончишь заниматься. Send me a text message when you finish studying. Т9 - офигенно удобная штука, смс-ки сейчас набираю только ею. 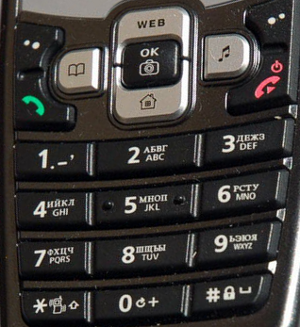 (source) T9 is awesomely convenient. It's the only way I type text messages now. * For comparison's sake, I should say that I purchased my first cell phone in the States in 1998, although they were available before that.